The Red Cross and Red Crescent Museum is located in Geneva, Switzerland. The Museum tells the often moving and sometimes depressing origins of the organization, from the battlefield of Solferino to worldwide relief efforts today. 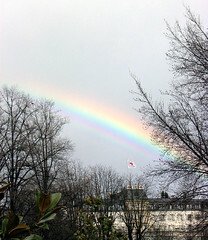 I happened to capture this rainbow over the museum during my visit back in February. For more information visit their website: http://www.micr.ch/index_e.html.